Down Cloverlaine: This One's For the Girls. 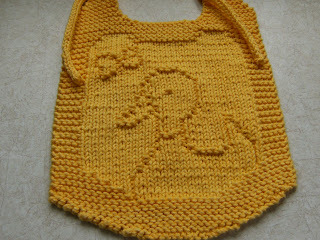 Finally, here's one of the bibs I did with little girls in mind. Not to say that it wouldn't look cute on a boy as well. I had this one all set to go, but after knitting it up and looking at it for awhile, I decided that it needed some changes. Originally, I had a bow around the duck's neck, but it was pretty difficult to determine exactly what it was. Sometimes, a design will look so cute charted up, but then once it's knitted, it looks like crap! I decided to stick with simple and I'm happy with the results. I don't have the directions done yet for a dishcloth, but I'll work on it. Now, as for those who knit for boys, don't despair because I have a different version done that would look super for a guy. At least I think it will.... I haven't knitted it up yet! Copyright 2009 by Elaine Fitzpatrick. Permission is granted to make and sell items from this pattern provided that credit is given to me as the designer. Permission is not granted to reproduce the actual pattern, or post it, or distribute it, without my express permission. I worked hard to produce this pattern for you, so please respect my copyright and play nice! Materials: One skein of worsted weight cotton if you are using the bib for meals. If, on the other hand, you want to use it as a “drool” bib, I recommend using a superwash wool. The cotton has a tendancy to absorb the moisture, whereas the superwash wool will wick the moisture and keep baby nice and dry! 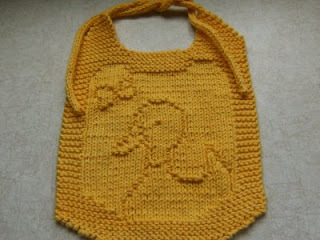 The bib pictured was done in Peaches & Crème in yellow. Row 14: k13; p12; k13. Row 15: k25; p1; k12. Row 16: k11; p1; k1; p14; k11. Row 17: k25; p1; k12. Row 18: k9; p3; k1; p16; k9. Row 19: k25; p1; k12. Row 20: k7; p6; k1; p17; k7. Row 21: k6; p1; k17; p1; k13. Row 22: k5; p9; k1; p16; k1; p1; k5. Row 23: k6; p1; k16; p1; k14. Row 24: k5; p10; k1; p15; k1; p1; k5. Row 25: k6; p1; k5; p4; k6; p1; k15. Row 26: k5; p11; (k1, p4) 3 times; k1; p1; k5. Row 27: k6; p1; k3; p1; k6; p1; k3; p1; k16. Row 28: k5; p11; k1; p3; k1; p6; (k1, p2) 2 times; k5. Row 29: k7; p1; k2; p1; k6; p1; k1; p3; k16. Row 30: k5; p11; k1; p2; k2; p6; k1; p1; k1; p3; k5. Row 31: k8; p1; k1; p1; k6; p1; k3; p1; k16. Row 32: k5; p11; k1; p3; k1; p6; k1; p1; k1; p3; k5. Row 33: k9; p2; k6; (p1, k3) 2 times; p3; k10. Row 34: k5; p5; (k1, p2) 2 times; k1; p3; k1; p6; k2; p4; k5. Row 35: k10; p1; k5; p1; k4; p1; k1; p1; k3; p1; k10. Row 36: k5; p6; k1; p3; k1; p6; k1; p10; k5. Row 37: k15; p1; k5; p1; k3; p1; k12. Row 38: k5; p7; k1; p3; k1; p6; k1; p9; k5. Row 39: k14; p1; k7; p1; k1; p1; k13. Row 40: k5; p8; k1; p1; k1; p7; k1; p9; k5. Row 41: k14; p1; k7; p1; k1; p1; k13. Row 42: k5; p9; k1; p3; k1; p4; k1; p9; k5. Row 43: k14; p1; k8; p1; k14. Row 44: k5; p9; k1; p8; k1; p9; k5. Row 45: k14; p1; k8; p1; k14. Row 46: k5; p10; k1; p7; k1; p9; k5. Row 47: k15; p1; k6; p1; k15. Row 48: k5; p2; k2; p7; k1; p4; k1; p11; k5. Row 49: k17; p4; k7; p1; k1; p1; k7. Row 50: k5; (p2, k1) 2 times; p22; k5. Row 51: k24; p4; k2; p1; k7. Row 52: k5; p1; k1; p3; k1; p3; k1; p18; k5. Row 53: k23; (p1; k3) 2 times; p1; k6. Row 54: k5; p1; k1; p2; k1; p1; k1; p2; k1; p18; k5. Row 55: k24; p1; k1; p1; k2; p3; k6. Row 56: k5; p6; k1; p1; k1; p19; k5. Row 57: k24; p2; k12. Row 60: k6; p7; k12; p7; k6. Row 62: k7; p5; k14; p5; k7. Row 69: k13, bind off the next 12 stitches knitwise, and knit remaining stitches. Note: As you look at the bib, this will be the left side. All the decreases are made on right side rows. I have included a couple of tips below. This is so sweet! I don't know how you do it...all these beautiful designs. I have a baby shower in 2 weeks. I can get this bib done in time, and perhaps the washcloth too!